Cleopatra Games is unique with the way rewards are given. There are 3 big winners contests in the middle of the sim where you can gain a high win in competition with other players. Most of the games have a Dropping Score Jackpot too, but besides that all rewards go through te Winners Contests. Each game you play at Cleopatra Games counts for each winner’s contest. Your score on a winners contest is the amount you paid to the game plus the amount you won. In case you don’t win, it is only the amount you paid. in total per week L$309,200. The Winners Contest do not pay out in cash but in Game Credits. You can use these game credits to play for free, as long as you have credits, each game you play will be refunded. (e.g. you have L$708 in credits and play a game of L$1000, you will be refunded L$708. If you would have played L$500, you would be refunded L$500 and L$208 would remain for next game). These credits remain valid for a week after the last time you played a game. So if you play a single game now, your credits remain valid until next week, this time. Try to conquer a good spot on the boards. This is not always the top spot. Sometimes the distance between you and the player above you is so big, it won’t be worth playing in order to pass them. Some players also gain good results aiming on the lower spots, during quiet hours. If other players are playing heavily on more costly machines, gaining a spot below them could be very beneficial. The pot will end up very high. If you are playing heavily on more costly machines, perhaps divide it over 2 sessions, so you’ll win this contest twice. Watch what others do and determine how much to play and when to play it, in order to make an optimal benefit of this contest. Look at all 3 the boards, on all 3 the boards you compete with the same players. 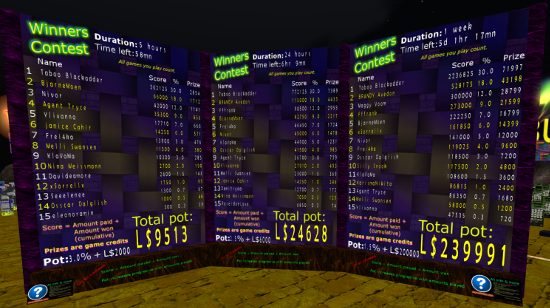 You optimize your winnings when you get the biggest pie of all 3 pots, at the lowest costs. And …. win on the games. Your score on this contests is the amounts you played plus the amounts you won. So winning is a pleasant and easy way to go up on these contests fast. Remember those games are Skill games, playing concentrated really really helps.